The 700th anniversary of the Battle of Bannockburn, 23-24 June 1314, is now less than a year away. 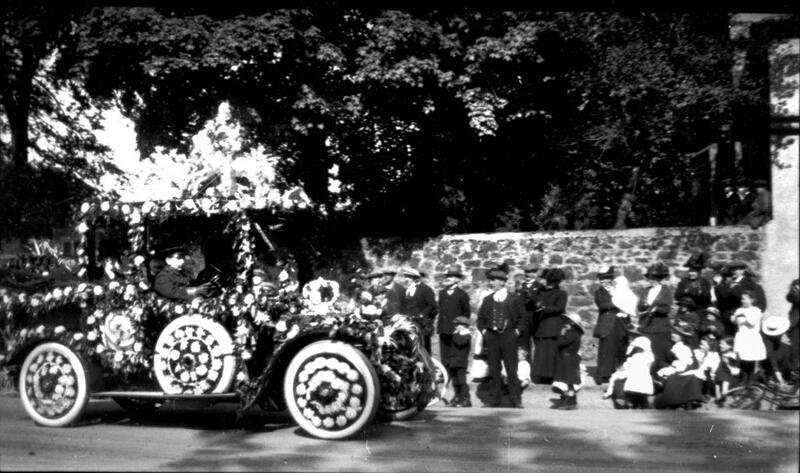 Pictured here is a flower covered car from the 600th anniversary in 1914, one of a series of photos in the Smith’s collection showing the great pageant procession through Stirling, from King’s Park to the Borestone. Stirling always knows how to put on a good show, and the 1914 procession was one of the largest. 22 Scottish burghs, including Aberdeen, Edinburgh, Dundee, Perth and Glasgow all sent representatives. Many of the clans sent contingents, and there was representation from many Friendly, Temperance and Masonic Societies, along with the Scouts, Guides and Boy’s Brigades. The mile long procession had an estimated 25,000 spectators. The day was concluded by a public banquet for 200 people in the Albert Halls at night, where Sir George Douglas proposed a toast to ‘The immortal memory of Bruce and Bannockburn’.